The Institute for Health Metrics and Evaluation (IHME) reported that an estimated 8.9 million people died from various forms of cancer across the globe in 2016. From the ﬁgure, tracheal, bronchus, and lung cancer claimed the largest number of lives globally with 1.7 million, the IHME reported. In the Philippines, the Department of Health's 2015 estimate of new cancer cases was 109,280 with 66,151 deaths. Lung cancer was the top killer with 11,775 deaths or 18 percent of all cancer deaths. Paul Perez, Cancer Coalition Philippines (CCP) spokesperson and founder of Project: Brave Kids, a volunteer group that helps children cancer patients, described cancer as a catastrophic disease not only for causing deaths but also for causing emotional and ﬁnancial hardship to families of persons suﬀering from the disease. Getting diagnosed with cancer is like a death sentence that leads to so much emotional stress for both patients and their loved ones. The high cost of treatment is also a great burden in ﬁghting cancer that greatly aﬀects patient survival. In the ASEAN Costs in Oncology study conducted by the George Institute for Global Health, it was found that 75 percent of cancer patients in Southeast Asian countries landed themselves in a ﬁnancial catastrophe within one year of diagnosis. The main reasons are: not all cancer drugs are funded by the governments, subsidies are not enough, there is lack of medical resources and there are not enough cancer specialists. Cancer treatment expenses include consultation, lab tests, biopsy, surgery, chemotherapy or radiotherapy, drugs, hospital accommodation and professional fees. A cycle of chemotherapy can cost up to P100,000 or more. On top of the medical cost, there are the associated burdens of transportation expense if the patient is far from the hospital, inability to work, and children and household left unattended. 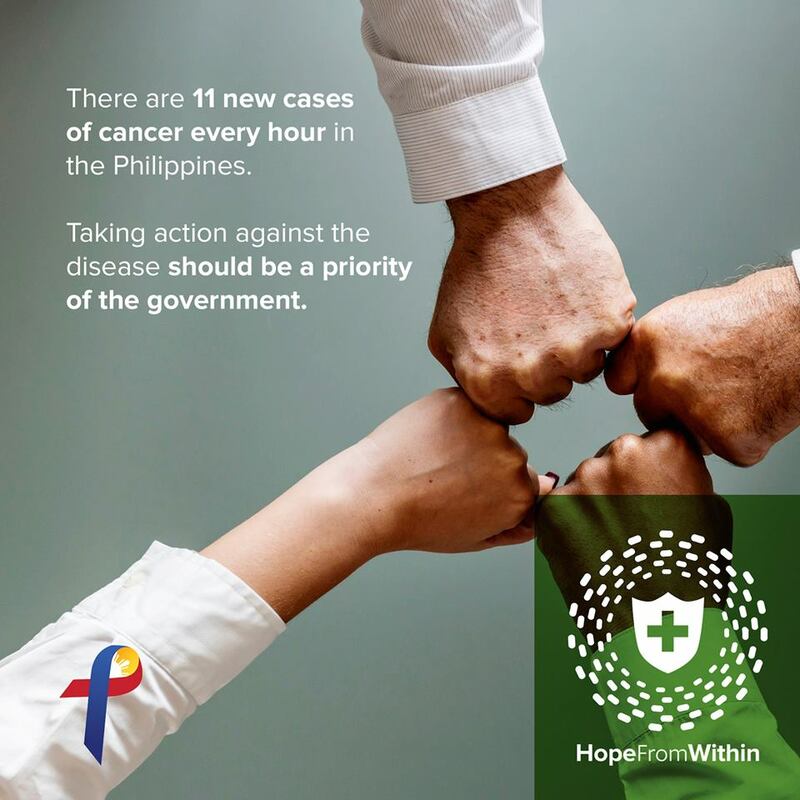 While the government subsidizes cancer treatment through the PhilHealth and the Philippine Charity Sweepstakes Oﬃce, it doesn't cover the entire cost of therapy because the fund is divided among the many subsidy applicants. Also, there are the long queues and waiting times to contend with at government oﬃces that provide ﬁnancial assistance for the sick though this is being addressed with the setting up of one-stop-shop desks at every major public hospital across the country. Congress has come up with a bill called National Integrated Cancer Control Act that aims to ease the burden of cancer in the country by establishing and funding a national cancer control program. There is also the a Hope from Within advocacy to look to for support in advancing critical areas in ﬁghting cancer such as early detection, increasing access to treatment, and survival. It also informs about the innovative cancer treatment op6on called immunotherapy, where the immune system is fortiﬁed to ﬁght cancer cells. Many clinical studies all over the world showed that this therapy has added more years of survival to cancer patients.